This Weekend I Made Ricearoni: A Memoir | Priya the Blog | life & style in Nashville & beyond! I've been doing a lot of writing as well as thinking about writing, both of which I love. My work friend Mike Lane, who is basically the best, told me I should do everything I possibly can while I'm young (somewhat check), keep a journal (check), and then write a book one day (hopeful check). So I'm brainstorming titles for my memoir, that's what I've come up with so far. I really enjoyed this weekend! It was a perfect balance of a busy Saturday, a relaxing but productive Sunday, and a Friday that was a little of both (I like to think of every weekend as a 3-day-weekend. What can I say, I'm an optimist. Either that or I can't count). 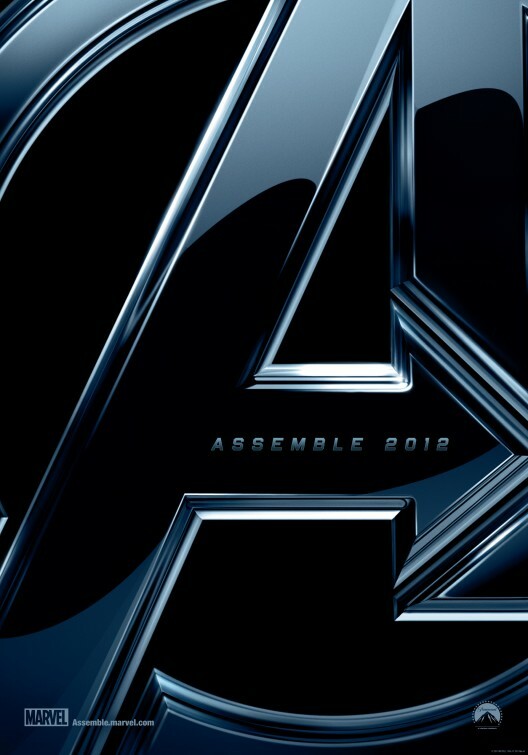 Friday I got off work early, took a little nap, finished watching Ironman while Hunter made me Mac n Cheese, stopped by Walgreens to buy some candy (Hershey's cookies & cream for him, Reeses cups for me, peach rings for both) and saw The Avengers to finish up our #avengerweek. I desperately wanted to dress up, but as a girl, Avenger costume choices are pretty limited. I still enjoyed it, detailed opinionated movie reviews to come! We had a discussion about movie posters afterwards, and both agreed that this one is awesome. Saturday morning Hunter and I made a list of all the things we wanted to do that day, including previously scheduled activity for that evening. I'm a list-maker, and he's just too sweet to deny me that. Although, it made for an extremely productive day including: a trip to the post office to send my grandparents some pictures from our trip to Finland, a racquetball match, showers, a lunch of chicken legs, ricearoni & salad, a visit to the MAC store, a Painted Cupcake (I had the "Ike Johnson", red velvet with cream cheese. A cupcake store walking distance from my house? Ride into the danger zone) and a little more shopping at Local Honey & Old Navy (scored SUPER comfy cargo pants but not like "6th grade science camp zip-off" cargo pants. They're black and hopefully sophisticated). On to scheduled activity: we went on the Yazoo Brewery tour! 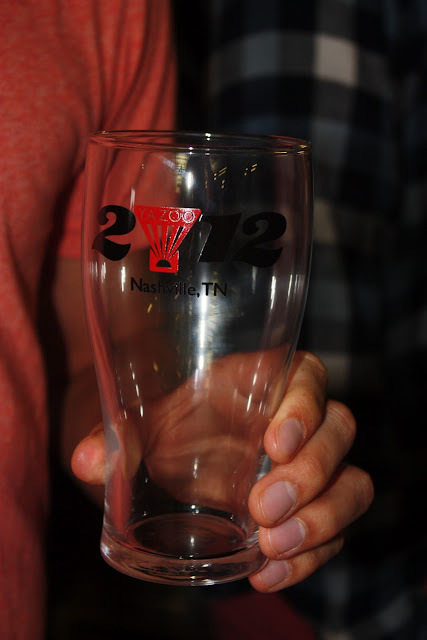 We got these awesome commemorative glasses! I actually like learning about something that I knew very little about, and the tour wasn't tooo long, for those of us with shorter attention spans...ahem. For those of you here in Nashville, definitely check it out! From there we went straight to celebrate our sweet friend Andrea's birthday. She's about to turn 20! Andrea...and this is our friend Jacob. How much did I LOVE the Latin hospitality, dancing/music, and food?! Soooo very much. We had a marvelous time. Happy birthday to you Andrea! Finally, Sunday I amazingly got up early to run with some people. It was hard, but it actually felt really great and I'm happy to have friends to run with. Then we visited a new church that I had never been to. They were having their VBS wrap-up Sunday which is traditionally the best Sunday of the year. Tiny kids singing their hearts out with hand motions? Love! Also VBS has come a looooong way since I was a kid. Their theme was aviation and seriously there was a scaled model of a plane hanging from the ceiling. Plus a media team that made like a documentary of the week. Back in my day, we were content with fishie crackers and paper bag vests! 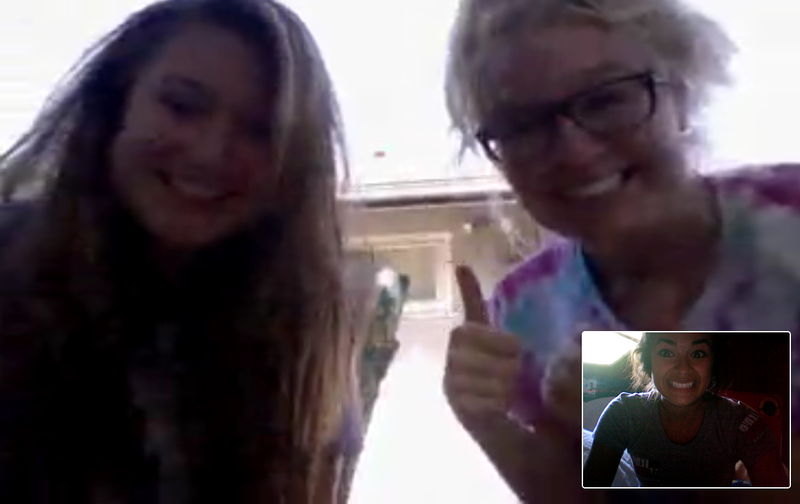 skyping my best friends from home! I asked them to give me thoughts on my blog and they said "...you just need more of us." Well I agree and I wish I could write every day how much they complete me and I miss them so much this summer! Last thing, Hunter got me these flowers because he's the sweetest and I couldn't resist getting a picture of them. still looking fab almost a week later! Way to go flowers! Exciting news: tomorrow I'm heading off on a business trip (of sorts) to Jackson, TN. Always excited to cross a new city off my list! I will most definitely keep you posted on that. Hope you all are having a marvelous, sunny but not too hot, start to your week!